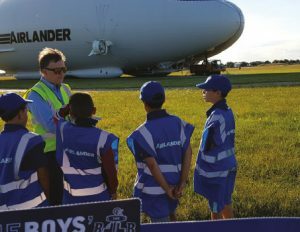 12 boys and Leaders from the 3rd Bedford Juniors went to visit the Airlander Airship at RAF Cardington near Bedford. The group was shown around the Airlander and inside the hanger by Andy Barton (Captain of 3rd Hemel Hempstead) who works at the site. It was a great evening, with the young people even having a mini Airlander to take home with them!